We are having one of the coldest and longest temps in two decades. There is a possibility we could break one hundred year records. There was no way Chris and I were leaving the house so we decided to make a really nice dinner. She decided to prepare us a rack of lamb with creamy polenta, fresh green beans with onion and red pepper. Once we decided what was on the menu, it was my time to pare the meal with a nice bottle of wine. After wandering through the cellar and pulling bottles I came across a 2007 Pine Ridge Tessitura red wine. 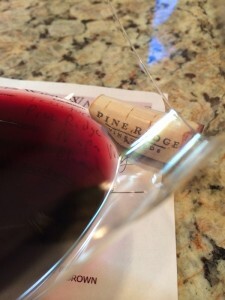 The 2007 Pine Ridge Tessitura was the first year Pine Ridge made this blend. Tessitura is an Italian word meaning Texture. After drinking the wine I have to agree there are layers of textures and flavors. We truly enjoyed the Tessitura with our meal. The Tessitura was very aromatic and the development was young-fruity. I could smell sweet ripe fruit, cherry, oak, and spice. The Tessitura was slightly dry and full-bodied. The acidity was lively. The tannins were medium and soft. Tasting the wine, there were complex textured mouth feels. The soft tannins were felt on the top of my palate. The finish was long and the wine was flavorful. I rated the 2007 Pine Ridge Tessitura four glasses. The wine paired perfectly with Chris’ meal. If you want her rack of lamb recipe click on the link below.